Ah December, a tangle of joy, bustling activity, gatherings, stress, over-commitment, surprises, anticipation, traditions, etc. Some approach December with joy and exuberance, yet much of the population struggles with depression during this season due to loss or family strain. And for me personally, the struggle of finding the real meaning of Christmas amid all the rest of the chaos happens every year. The assignment today has a purpose. The purpose is to enter this unusual month focusing on what makes December meaningful for each of us. We will each have a very different focus. I asked that you all prepare a list of 15 things that make December meaningful to you. 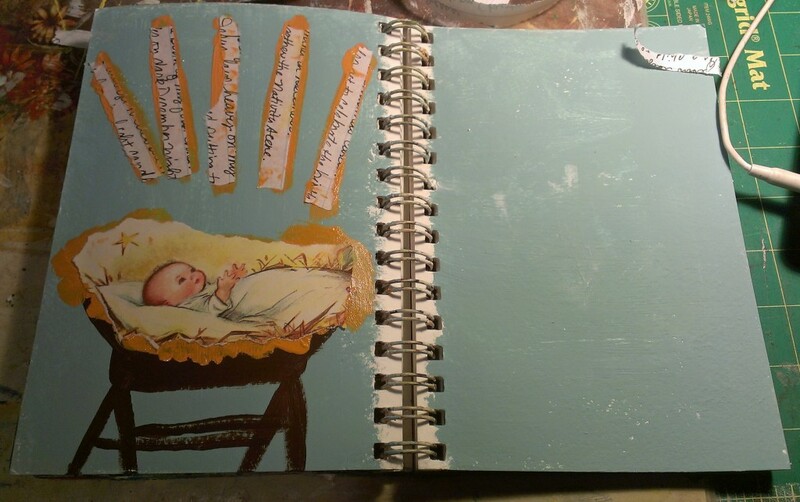 Have your list handy as we will incorporate them into our journal page today. Before we get started, read through your list one more time. Are you noticing a theme? Is there something about your list that stands out to you more than anything else? If so, let this become the focal point of your page today. If not, pick your favorite thing on the list as a focal point. 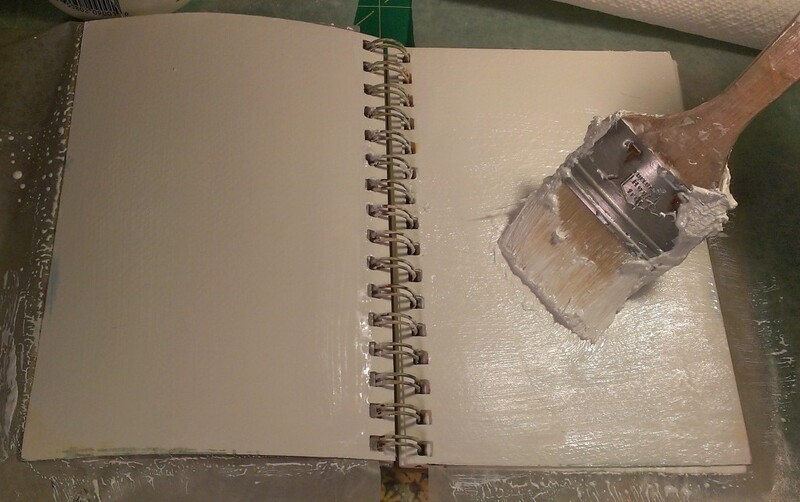 As usual, prep your page by painting on a layer of gesso (either white or clear is fine) and allow to dry. Use a blow dryer to speed up drying at any point. Next paint your background with a color of your choice. Keep in mind what your focal point image is and use a contrasting color. The theme that I found from my list was the birth of Jesus Christ. I found a children’s book with a manger scene and decided to build around that little image. To incorporate my list, I am tearing it in strips using a ruler as a tearing edge. I like tearing paper. If you prefer neat and tidy edges, please feel free to cut your paper. The strips will be used to accent our focal point. Rather than gel medium, we will be gluing down our strips with paint. First establish your focal point. I envision so many ideas for this month including evergreen trees, Menora’s, stacks of gifts, winter scenes full of snow and sleds, hot cocoa. 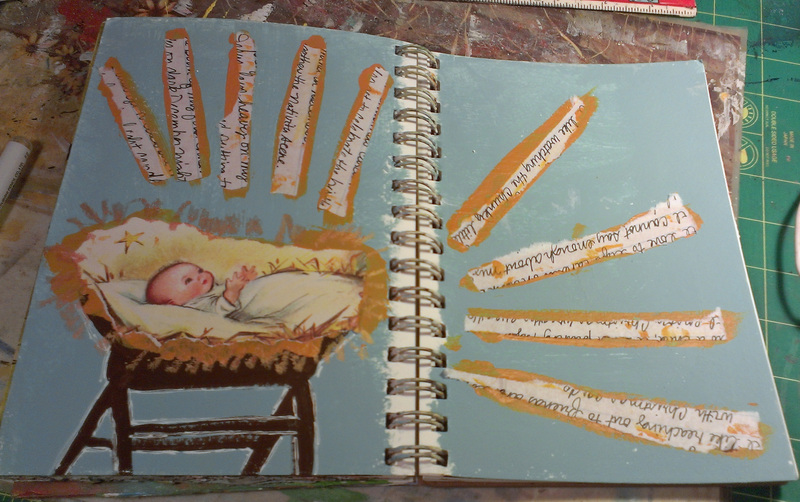 Mine is a manger with my little Jesus torn from a book glued to the page with a layer of straw colored paint. 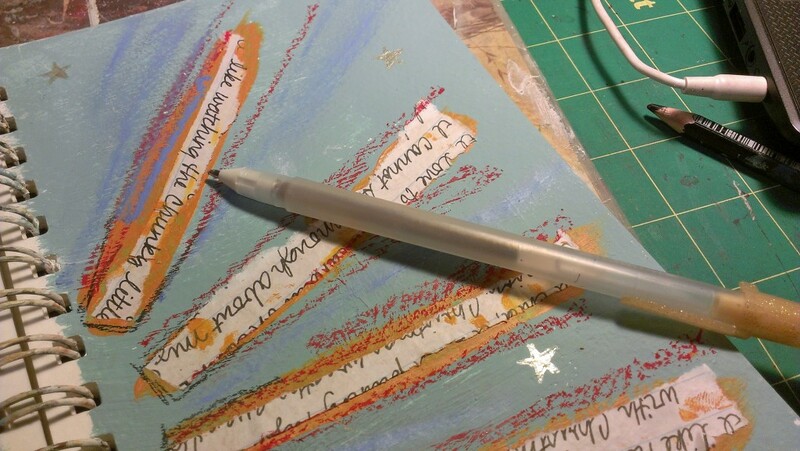 I then began adding my strips as beams of light by painting a thick line of the same gold and pressing strips of my list into the paint. I am not a tidy person. My strips are messy. My paint is messy. It is perfectly fine if yours is quite tidy. Keep adding strips until you feel satisfied. You do not have to add them all, nor do they have to be legible. After you have this base down of your focal point and your strips from your list, begin adding depth and color with oil pastels, pencil and pens. I find that gel pens work very nicely on acrylic paint, but very few pens work well on oil pastels, so add your pen details first. Continue to add details and color as you feel is best. Work intuitively so as not to over think color choices. Have fun smudging some of your oil pastel and perhaps leaving some be. 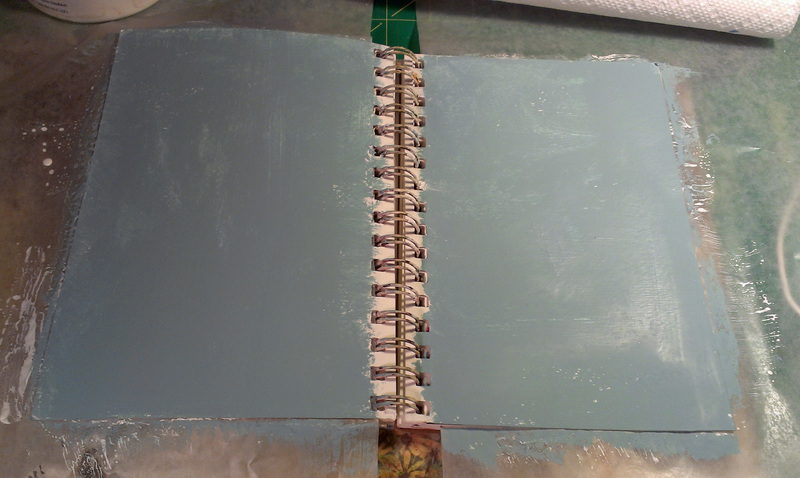 When you feel you are done with the oil pastels, paint a layer of CLEAR gesso over the top of your pages. Double check that you are using clear and not white. 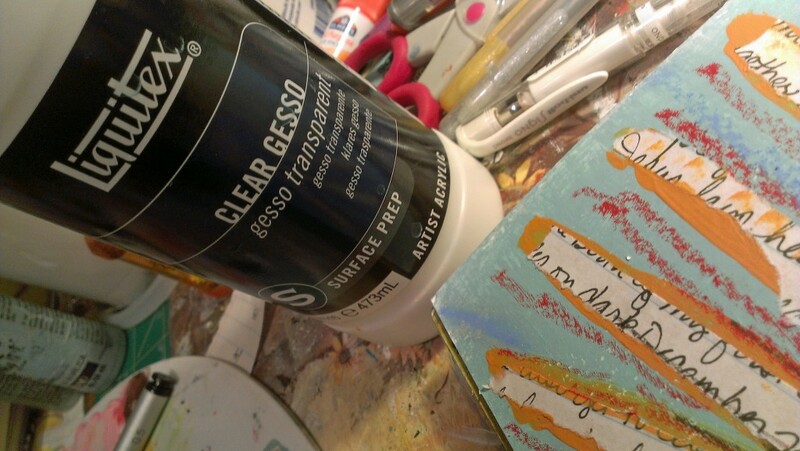 The clear will look white as you paint it on, but will dry transparent. 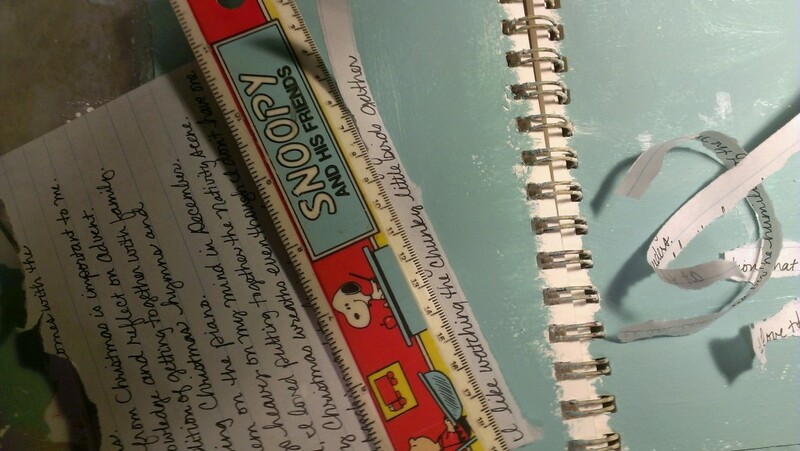 Now your oil pastel will not smudge, and you have a nice surface if you decide to journal more on your pages. 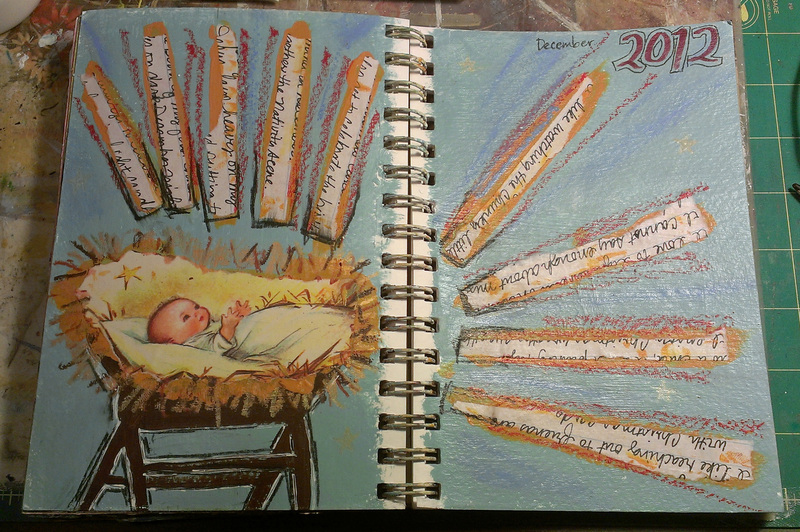 I decided to add the month and year, and may journal on this page throughout my December. And with that I wish you a very meaningful December. This actually would be a great exercise each month, finding meaning in the cycle of the rhythm of life.